Michelle Bachelet, the president of Chile, together with Jean-Paul Luksic, chairman of Antofagasta Minerals SA (“AMSA”) and Mike Garland, CEO of Pattern Energy Group Inc officially opened operations at the 115 MW El Arrayán Wind facility in a grand opening ceremony at the project site, which is located 400 km north of Santiago on the coast of Chile. 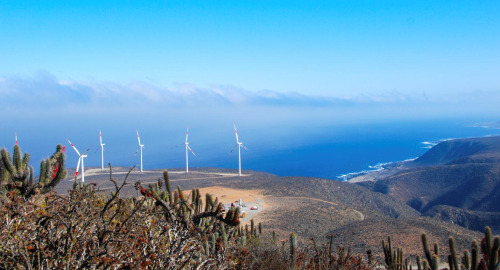 The El Arrayán Wind facility, which completed construction in June, will generate clean, renewable power equal to the needs of approximately 200,000 Chilean homes each year, according to the World Bank. The facility is utilizing 50 Siemens 2.3 MW wind turbines, which Pattern Energy is also using at other wind projects in Canada and the United States. El Arrayán Wind connects to the Sistema Interconectado Central's 220kV transmission system. The facility is located on approximately 15,320 acres of coastal land on a long-term lease with a single landowner. Compared to generation from a coal-fired power plant, the electricity produced annually by El Arrayán Wind will offset more than 300,000 metric tons of carbon dioxide, the equivalent to the annual carbon footprint of an estimated 70,000 Chileans, and will conserve enough water to meet the needs of more than 11,000 Chileans, according to statistics from the International Energy Agency, the World Bank and the US Energy Information Administration. Approximately 200 jobs were created during construction of the El Arrayán Wind facility. In addition, 15 ongoing permanent positions were created. The project was constructed by Skanska Chile SA, a subsidiary of Skanska AB and one of the leading wind-focused construction firms in Chile. 1. Chile's goal is to have 45% of its energy come from clean energy resources by 2025, according to President Michelle Bachelet.